« Style interest from accessories rather than clothes ? What is the style of your accessories ? hard-edged or soft, colours or neutrals. . .
Janice of The Vivienne Files recently suggested a very basic wardrobe of classic knits, tees, shirts and slim jeans/ pants, to be worn as the background to interesting accessories. Here’s her post, and my post on possible patterns for the clothes. Nancy Nix-Rice suggested a basic group of accessories as part of her classic wardrobe plan. I have a post on that here. She uses accessories to integrate an outfit and give a finishing touch, not for individual expression. Here’s another style consultant’s post about trendy accessories. The approach of Janice’s simple wardrobe is to wear clothes which attract no attention, and add your own special style with the accessories. While Nancy’s approach is to choose accessories in the same neutral colours as the clothes. Opposites. A huge range of possible choices. Specific accessories can be high fashion, and ‘must have at all costs’ items for fashionistas. Paying £500, £5000, £50,000 for a bag or shoes is not something I aspire to. Hermes wants £1350 from me for replacing my wallet, and it doesn’t look as useful as my present one. I think I would look elsewhere even if I was a multi-millionaire (which I also don’t aspire to :D). Though I agree it must be real leather. Hmm, back to using baskets or fabric bags. 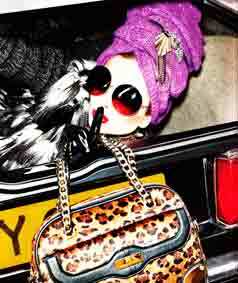 . .
Happily accessories can be a way of expressing individuality. For the students round here, cheap clothes are black, grey, or denim. So they wear a fascinating range of scarves, boots, and bags. Have you got a ‘signature’ accessory ? shoes, or boots, or bags, or scarves, hats, eyeglasses, gloves, socks, belts, patterned pantyhose ? or do you always wear earrings, or bracelets, or pins, necklaces, rings, hair ornaments, body piercing, special watches ? I’m a bags and scarves person, occasional pins or bangles. . .
And what style of accessories would you choose ? What prints/ textures/ shapes/ colours for your scarves ? What materials, shapes, embellishments for your bags, your shoes, your hats ? There’s a huge variety of possible styles for each jewellery item – dainty or striking, angular or curved, smooth or textured, modern or antique, real or fake, in different materials – wood, stone, fabric, metal, plastic. If you’re not sure, visit an accessories store and allow yourself to notice what you’re attracted to, without censoring that those things are too vulgar/ dainty/ impractical/ dull. . . Then try them – do they make you feel special ? centred ? ready for a laugh ? The fun aspect of scarves and jewellery is that it’s possible to experiment, without overspending if your choice turns out to be a long-term mistake. All these accent colours contain some blue. As the wardrobe is mainly denim blue, yellow toned accents like yellow, orange, scarlet would make a much more forceful contrast – not to everyone’s taste. Animal prints could work well. P.S. Janice added a ‘common wardrobe’ in warm colours, here. P.P.S. There are many more of these, as Janice adds a new colour to her accessory suggestions nearly weekly. She has also added a ‘common office wardrobe” with a skirt and blazer. Here’s her ‘common wardrobe’ category. Janice is an excellent source of accessory inspiration to try out, if you like non-aggressive combinations. The Vivienne Files always has an underlying focus on elegance. This is called ‘blogger’ style by UK Elle (October 2012) : over-sized accessories, bold clashing prints, fun fur, patchwork, plus chunky knits and added fabric textures such as studs and embossing, also slim pants, below knee pencil skirts, and ankle socks or ankle boots. Develop your skill. Experiment by putting together colours/ patterns/ shapes/ styles that you don’t think will work, that are supposed to be ‘wrong’ together, and see if you like/ enjoy/ have fun with the result. Try some barely noticeable integration. Perhaps mainly blue toned colours, like the top photos. Or mainly yellow toned colours. Or smaller amounts of varied colours mixed with a lot of black white grey and metallics, like the lower photo. Here’s a You Tube from Iris Apfel about her love of accessories. Using clashing accessories does look a fun style, but not one I would be comfortable wearing myself. I may blog but I’ve never aimed for attention grabbing ! Which of these accessory styles is more to your taste ? What colours/ materials/ shapes/ sizes/ amount of variety do you enjoy wearing for your accessories ? This entry was posted on October 6, 2012 at 10:30 am and is filed under personal style. You can subscribe via RSS 2.0 feed to this post's comments. Both comments and pings are currently closed. I do not consider that my use of accessories is extreme, but I do have a signature accessory, in that I almost always wear hats, particularly hats with wide brims… shoes for me are pretty much strictly utilitarian, I do wear shawls/scarves in the wintertime, and try and remember to wear jewelry other than earrings. Many of us have difficulty with hats. Personally I’ve only recently realised my problem isn’t just that I’ve got a large head, so can’t buy many that fit – also I’ve got a long face, so many styles aren’t good. Me in a beanie looks ridiculous ! Now I know about the problem I’m going to explore some more.